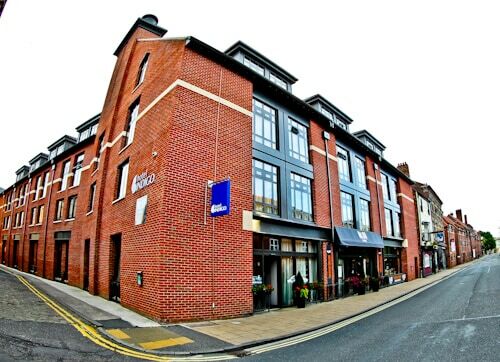 Hotel Indigo is a hotel you should consider if you want a true Yorkshire experience in the center of York. In addition it’s the only one of the hotels in York which offers a complimentary minibar. For the latest York hotel special offers and events check out the Hotel Indigo York website, Twitter, Facebook or Instagram pages. The hotel is located within the York city walls. In fact, a 2 minute walk up the road (above) will take you to one of the York city wall gates, Walmgate Barbican. From this city gate, you can start a walk around the York city walls. Points of interest of York include the York Minster, Shambles as well as York Castle (Clifford’s Tower) which are all less than a 10 minute walk from the hotel. The staff at the hotel are very friendly which means you’ll receive a warm Yorkshire welcome on check in. I recommend you take a map from reception so you can plan which sites you’ll visit during your stay. 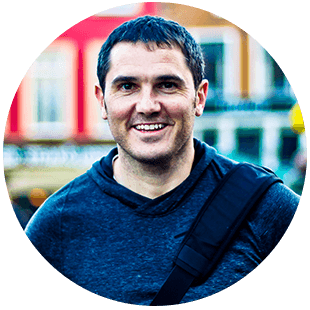 Additionally, the staff will be more than willing to offer advice and suggestions for your visit to York. 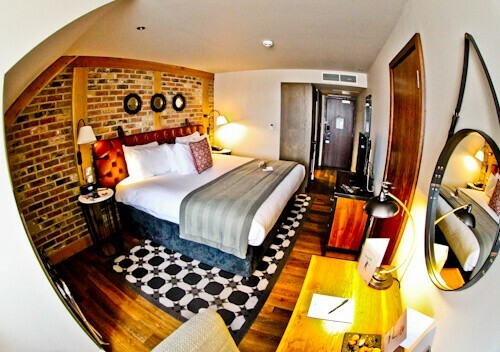 The beds at Hotel Indigo York are super comfortable, you’re guaranteed a good nights sleep. Whilst relaxing on the bed you’ll be able to watch a wide variety of channels on the 40″ HD flat screen TV. Something very rare about the mini-bar here is that it is complimentary, not many hotels in York will offer this! Additionally there is some of York’s very own chocolate in there, Guppy’s chocolate. This chocolate is delicious, don’t worry if you eat it all, there is plenty more for sale in the lobby! The reason the bathroom deserves a special mention is not because of the fountain showers or the bathrobes but because of the complimentary toiletries. The toiletries are sourced locally from H2K Harrogate and smell wonderful. There is an elevator but it’s worth taking the stairs as it’s such a beautiful staircase. The cast iron balusters were designed and made locally. As you go down the stairs you’ll notice each floor is numbered and the floor number is surrounded by posters and artwork of all things famous from Yorkshire and Britain. You’ll see artwork of anything from the York races to a Penny black stamp. As you reach the bottom of the staircase the wall is designed to look like a bar of chocolate. The staircase is a good place to take pictures and fill up your Instagram feed! In addition you’ll learn a few Yorkshire facts. 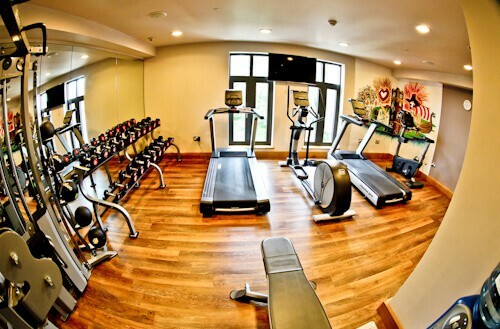 You must visit the gym, if not to exercise, to check out the artwork (above right). By studying this artwork you can learn a lot about York. You’ll see a Kit Kat, as well as a Terry’s Chocolate Orange. These 2 famous chocolate varieties were both created in the city of York. Additionally, you will see a viking ship, the York Minster, as well as the Shambles. Breakfast at the hotel is actually what I would describe as a double breakfast. I’d describe it as a double breakfast because not only can you order a full Yorkshire breakfast (above) but you can also enjoy the breakfast buffet (below). In addition, as this is a vegetarian friendly York hotel, there is a vegetarian option to enjoy. The breakfast buffet offers fresh juices, fresh bread, fresh waffles and one of the most delicious chocolate muffins I have ever tasted. 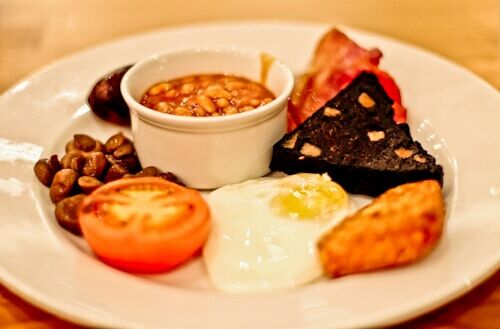 Check out the full breakfast menu, foodies visiting York will love the breakfast. The bar has a selection of great Yorkshire beers, I wish I had visited with my Dad as he would have loved trying them. For those not familiar with Yorkshire there is a map of Yorkshire behind the bar explaining where each beer comes from (above left), additionally there’s also a cocktail menu up there. 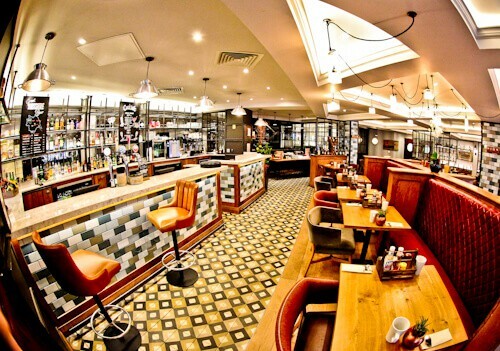 The restaurant at the Indigo York is called Walmgate 88 and is open from 12-10 pm daily. Foodies visiting York who want to try local, well prepared Yorkshire food must check out Walmgate 88. 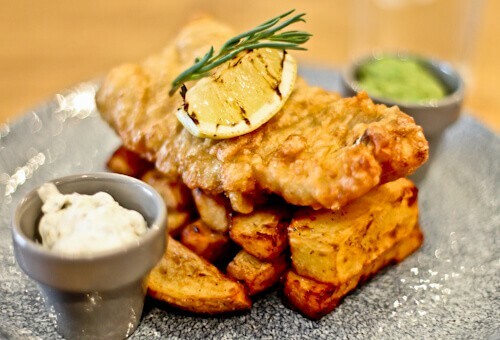 Just by looking at the fish and chips (above) you know they are delicious! You can check out the restaurant menu here as well as make reservations and check promotions. Make sure you take full advantage of the complimentary minibar which is filled with local chocolates and goodies. 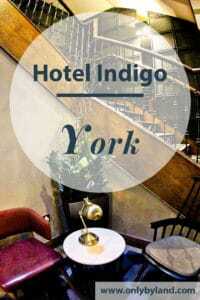 For the latest special offers check out the Hotel Indigo York website, Twitter, Facebook or Instagram pages. Hotel Indigos are usually pretty reliable. I like how colorful they tend to be. Just wish that IHG had a better rewards program – it’s not even in the same league as Hyatt or Starwood. Sounds like a great place to stay in Yorkshire. The free mini bar and locally sourced toiletries are a nice touch. 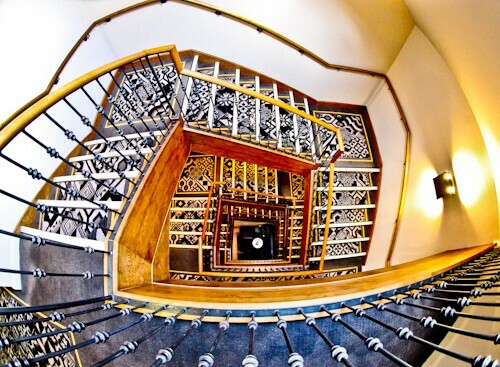 That stair case is amazing- I can imagine that with every ascent of descent you would notice something different. You had me sold on the ‘chocolate’ theme. I had no idea that York was the home of chocolate. Sounds like a delicious place to visit I’d love to stay here just for the breakfast and the amazing staircase. Sounds daft but it looks mesmerizing. This looks like a really nice place. Funny how the check in desk looks like a judges desk at the court room. Reminded me of that. And rooms are gorgeous. I’d love to stay there. This looks a lovely hotel I will definitely try and stay here when I next visit York. The breakfast looks so tasty you cant beat a good English breakfast when on holiday. Looking at the exterior of the hotel, I wasn’t expecting such a lovely interior. It really does look so warm and clean compared to some hotels I’ve seen in the UK. The complimentary mini bar and toiletries are something that was so surprising and I totally love the decor. Whenever I get to York, this is a place I would definitely like to stay. I’m still thinking about chocolate…How did I not know York was the home of chocolate!?! The breakfast options look fantastic! I love that there’s also vegetarian options simply because I’m not always game for heavy meats early in the morning. Woah chocolate theme!!! The rooms sure have just the right balance of old touch and new world comfort. Loved that staircase pics 😀 Surely a place to consider for me since it have veg options which is pretty rare in Europe I have heard. Wow, what a beautiful hotel. I really love boutique hotels – there’s something about the decor and uniqueness that really appeals to me. I especially love that staircase! Wow this place looks amazingly beautiful <3 I totally love the interior specially those staircase . The food looks so yumm which makes me wanna go there. I’d definitely stay here on a visit to York. The thing that I will remember about this post is that the mini-bar is complimentary. That is so cool with some chocolates too! The bath products sound awesome. I also look forward to using them whenever I stay in hotels. The tiles of the staircase are beautiful. The artwork in the gym looks interesting. Lastly, the fish and chips look delicious. The portion is reasonable too. I had no idea that York is famous for chocolate! 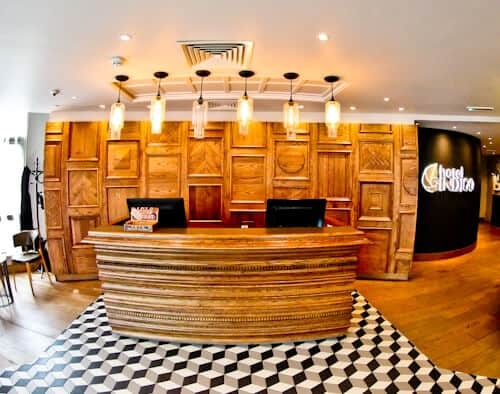 I’ve been to York plenty of times, as my parents have a holiday apartment there, and I think I might have seen the hotel Indigo while walking around 🙂 I love boutique hotels, and this one looks gorgeous!! I missed York when I was in UK! Looks like a beautiful town! Its awesome that the hotel is so close to all the famous sites! 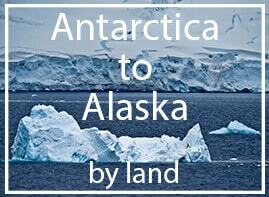 That’s the main consideration when you’re going to travel & explore and not to relax! The hotel looks interesting with the exposed bricks and strong tile patterns! The staircase looks absolutely stunning! 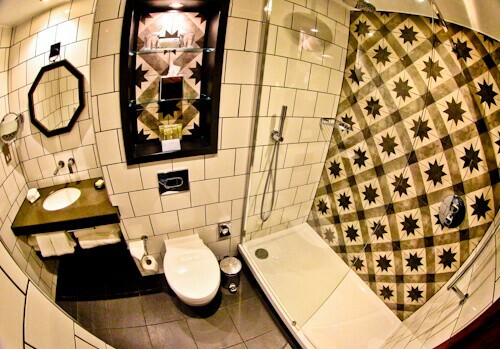 The bathroom looks so stylish..love the contrast. 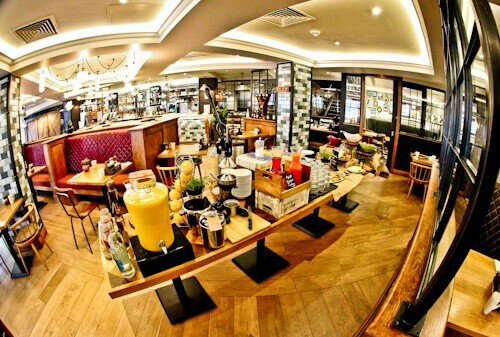 And any good hotel needs to have a good breakfast..your post has made me feel hungry! I am yet to go to York, and you have surely made me want to stay here when i am in town! This beautiful boutique hotel looks good from the pictures you shared. Sounds like a great place to stay in Yorkshire. I got sold on the interiors and food. Next time I am in the area, I’ll give it a try.